Ramon Martínez Máñez, Scientific Director of the Unit 26 of NANBIOSIS, together with researchers from his group and the group led by Professor Liz Marzal, both CIBER-BBN groups, have developed a new method to detect cocaine and Mycoplasma in very low concentrations. The method involves the combined use of mesoporous silica nanoparticles, molecular equipped with doors, and spectroscopy SERS (Surface-Enhanced Raman Scattering) a signal amplification system that uses gold nanoparticles to detect very low concentrations of the substances tested. According to the tests that have been developed in the laboratory, in the case of cocaine it has allowed them to nanomolar levels of detection, and the Mycoplasma genomic DNA 30 copies/uL. The detection system is based on the release of a dye easily identifiable spectroscopy SERS from inside silica nanoparticles, only when the species to be detected is present. “The pores of the nanoparticles are unblocked in the presence of cocaine and Mycoplasma or a dye that interacts with gold nanotriángulos is released, and is this interaction which is detected by SERS spectroscopy. The concentration of the substance to be detected is proportional to the detected signal”, says Ramon Martinez Máñez, Scientific Director of NANBIOSIS. 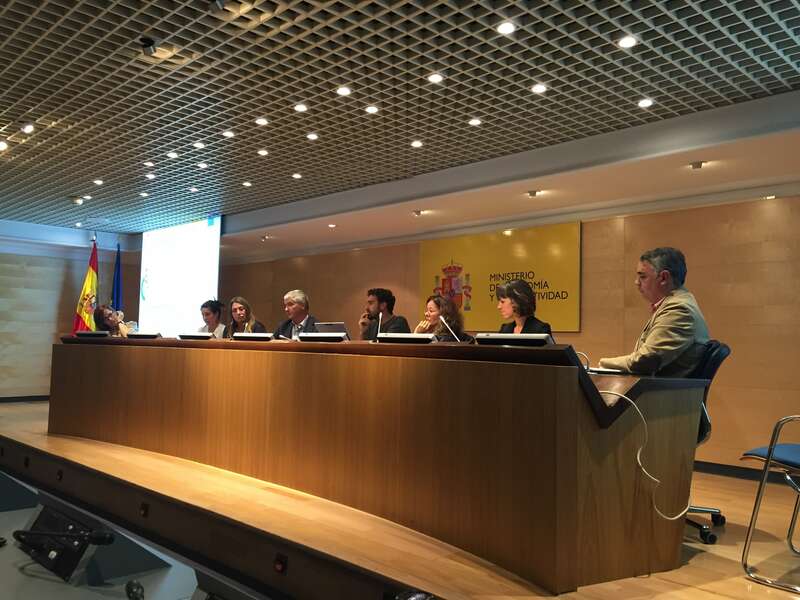 NANBIOSIS participates in the round table of the Working Day on Dissemination of ICTS, organized by the MINECO on September 19, 2016. Jesus Izco, Coordinator of NANBIOSIS, together with seven representatives of ICTS (Singular Scientific Technological Infrastructures) were invited to share their experiences and ideas on the Communication and Dissemination of ICTS in a round table within a working day on Dissemination of ICTS. The debate and conclusions will be set out in a document issued by the MINECO, specifying the activities to be carried out in the medium and long term. The event was presented by the General Director of R & D + I Policy, Maria Luisa Castaño Marin, and the General Director of the FECYT, José Ignacio Fernández Vera. Both stressed the importance of dissemination and public approach of the existence of ICTS Map and its role in the development of science in Spain as a strategic tool. Dr. Engel, Scentific Director of Unit 5 of NANBIOSIS, participated in the Barcelona International Youth Science Challenge (BIYSC) held in Barcelona from July 11th to 22nd 2016. Ms. Elisabeth gave the lecture “Biomaterials beyond a simple template”, introducing the students to the breakthrough in the medical and social field of obtaining a synthetic biomaterial that eludes the need of cell therapy or the application of morphogens and growth factors. The research group led by Elisabeth Engel hosted one of the projects of this programme: “Instructive Biomaterials for Regenerative Medicine” dealing with replacement or regeneration of human cells, tissues or organs, to restore or establish their normal function where ten students took a course on angiogenesis. BIYSC is an excellence programme, directed to undergraduate students, aged between 16 and 19 years-old, all around the with the purpose of stimulating scientific talent. It is a multidisciplinary programme (which includes several areas related with NANBIOSIS, like biotechnology, nanotechnology, biochemistry…) introduced by Catalunya – La Pedrera Foundation included lectures, workshops, scientific debates, and visits to international research centres. 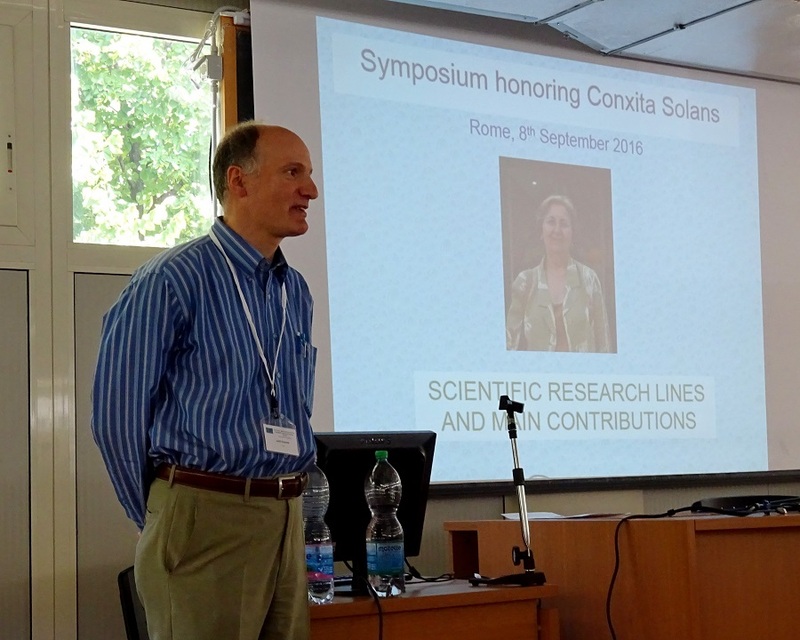 In the frame of ECIS 2016, the 30th Conference of the European Colloid and Interface Society (ECIS), Rome 4-9 September, 2016, a special Symposium honouring Conxita Solans was organized on September 8th – 2.00-5.00 pm. Conxita Solans, Scientific Director of Unit 12 of NANBIOSIS, has during many years been one of the leading scientists in the field of surfactants and dispersions. She has been very active in ECIS, presenting her research results at several conferences, being President and also organizing one ECIS meeting in Barcelona. In a study published in the journal Nature Communications, researchers of Nanomol group, led by the Scientific Director of Unit 6 of NANBIOSIS, Dr. Jaume Veciana have shown that the alignment of the energy levels in molecular bonds based on sel- assembled monolayers can be regulated through only chemical modifications. 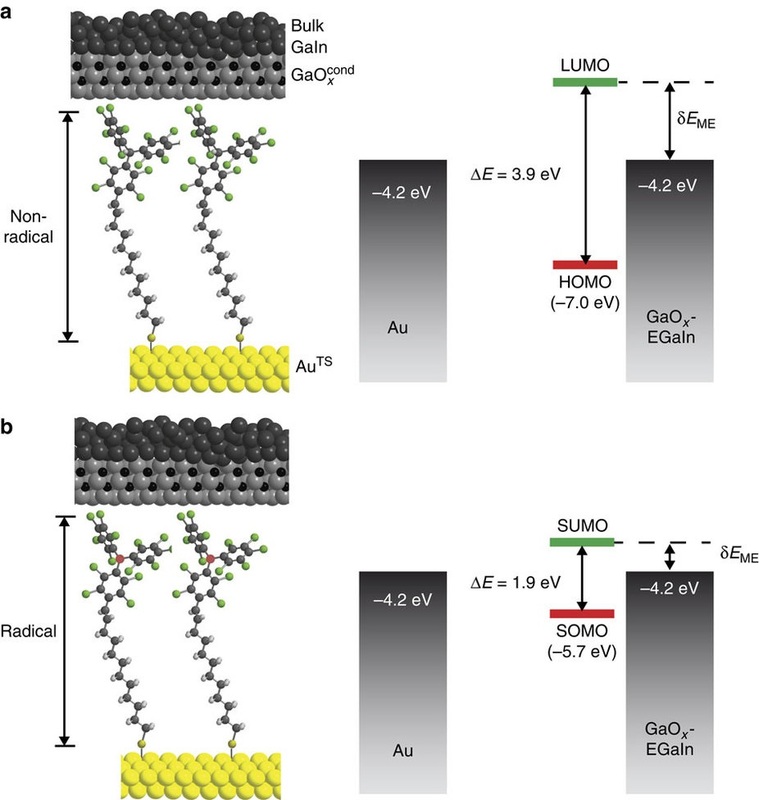 The energy-level alignment of molecular transistors can be controlled by external gating to move molecular orbitals with respect to the Fermi levels of the source and drain electrodes. Two-terminal molecular tunnelling junctions, however, lack a gate electrode and suffer from Fermi-level pinning, making it difficult to control the energy-level alignment of the system. Here is where the researchers report an enhancement of 2 orders of magnitude of the tunnelling current in a two terminal junction via chemical molecular orbital control, changing chemically the molecular component between a stable radical and its non-radical form without altering the supramolecular structure of the junction. These are the findings that demonstrate that the energy-level alignment in self-assembled monolayer-based junctions can be regulated by purely chemical modifications, which seems an attractive alternative to control the electrical properties of two terminal junctions. Chemical control over the energy-level alignment in a two-terminal junction. Li Yuan, Carlos Franco, Núria Crivillers, Marta Mas-Torrent, Liang Cao, C.S. Suchand Sangeeth, Concepció Rovira, Jaume Veciana*, Christian A. Nijhuis*. Nature Communications.